All the proposed sales tax hikes for transit in Tampa Bay have gone down in flames. Now there's a new scheme in Tampa Bay for how to get new pots of money to fund more transit. 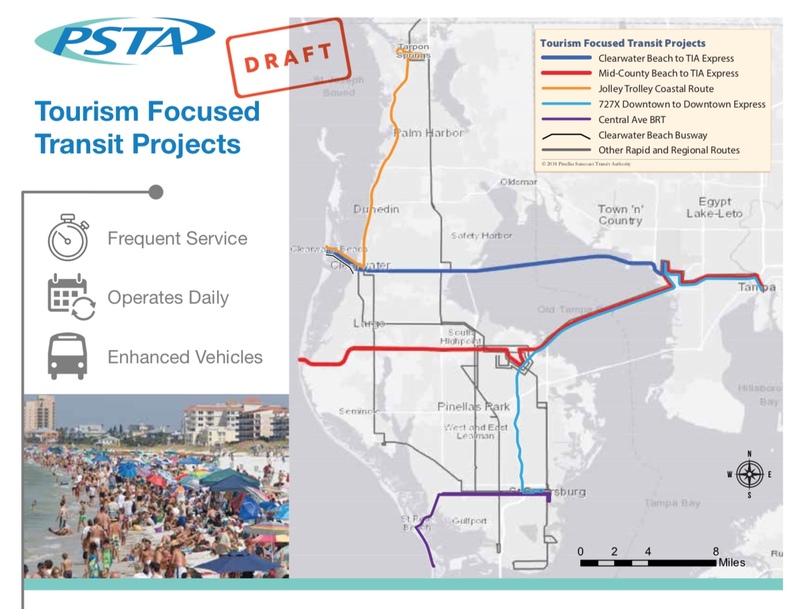 With transit ridership continuing to decline, even on their busiest route, PSTA (transit agency in Pinellas County) is proposing new funding sources to fund more transit. 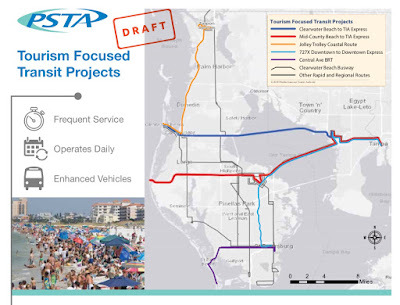 At today's PSTA Board meeting, the agenda includes PSTA staff presenting "Funding for Transit Investments". 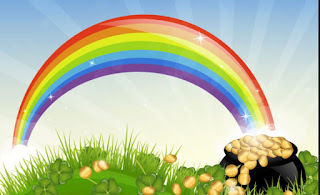 The first source of potential new funds comes from the tourist tax. The state legislature passed HB7087 this year which expanded the use of the Tourist Development Tax aka hotel bed tax. With certain conditions that must be met, the tourist tax can now be used as capital funding for infrastructure projects including transportation, sewer, drainage, etc. projects that (supposedly) positively will impact tourist related businesses in the county. At last month's PSTA Board meeting we attended, this tax was brought up by PSTA's State lobbyist (yes - PSTA uses your tax dollars to hire State and Federal lobbyists) and we saw dollar signs flashing in some of the Board members eyes. As we posted here, PSTA has a funding gap for their proposed Central Ave BRT. 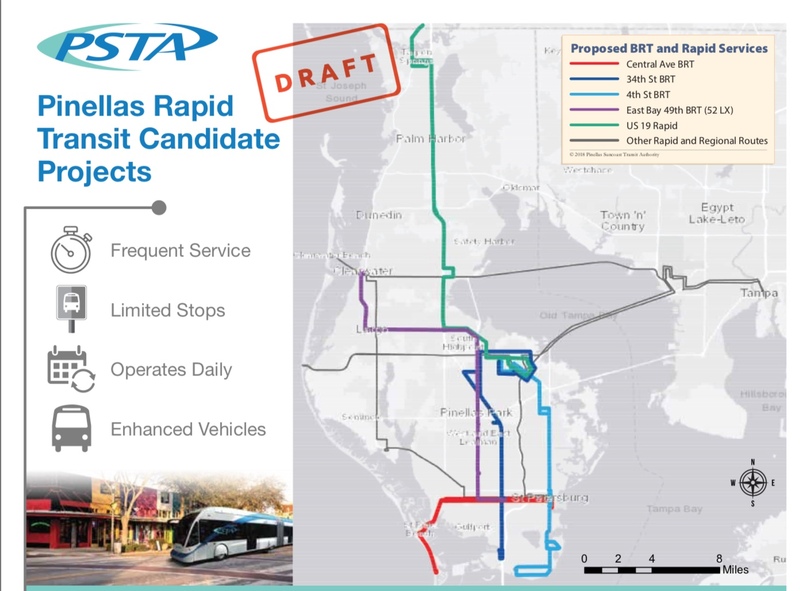 City of St. Pete Beach is not a funding partner for the BRT, and may not be, so PSTA must close the funding gap or reduce the size and scope of the project. Note that PSTA's Central Avenue BRT received their medium high rating from the Feds FTA because they used procedures for "entitled" ratings implemented by the Obama Admin. These procedures which allow entitled ratings enable grant requests to be made without having to provide more detailed information about the project - a post for another day. With PSTA's farebox recovery tanking to about 16% (aka taxpayers subsidize 84% of their operating costs), where will the money come from to fund all this? PSTA plans to pursue more federal funding for all these new transit services and they must have more committed local funding to pursue the federal funding. That is right - PSTA wants to raise your gas tax intended for roads, highways and bridges to fund more transit. PSTA wants to use toll revenues, that should be used to maintain and improve the toll roads, to fund more transit. According to Alltransit.org, 1.76% of commuters use transit in Pinellas County.